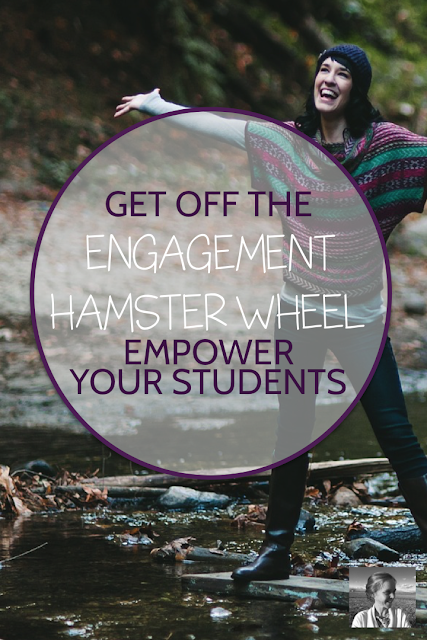 Do you ever feel like you're pursuing engagement, not empowerment, in your classroom? Do you ever feel like you're doing more work than your students? John Spencer used to too. But now he's all about empowering students to pursue their passions' nd helping teachers make that happen. Whether he's sharing "10 Creative Risks to Take with your Students this Year" via podcast, or adding video writing prompts and maker challenges to his youtube channel, you're going to be amazed by what he puts out into the teaching stratosphere. Once a middle school teacher who carefully wove creative practices into his packed schedule wherever he could, John Spencer now teaches teachers. In his own words, "I want to see teachers unleash the creative potential in all their students so that kids can be makers, designers, artists, and engineers." In his book, Empower, he talks about a mindset shift in the creative teaching world from engaging our students to empowering them to learn and do what they truly care about. I think you'll recognize your own teaching journey in what he described. The incredible amount of work required to differentiate projects and outline details so that students would produce just what you hoped. The exhaustion of your teacher song and dance to be constantly introducing something new, something amazing, something your students can't help but love doing under your careful supervision. It's so easy to pursue engagement, not empowerment. Not don't get me wrong, engaging students is a WONDERFUL thing to do. But it's nice not to have to think about it every single second. Nice when students feel engaged without a lot of help and guidance from you during parts of your curriculum. As the book goes on, John Spencer and his co-author, A.J. Juliani, introduce many ways to give yourself a break from what can feel like a hamster wheel. They show us how to build springboards that allow students to pursue their own passions, using the tools and skills of our discipline to make an impact on the world. I think you're going to love what John shares in this podcast episode. You'll be amazed at how POSSIBLE it is to empower your students and take the pressure off yourself at the same time. Get ready to find out how you can take doable, small steps towards a more creative, empowered classroom. It's so easy to feel overwhelmed by new teaching philosophies, or to feel trapped by the system at your school. That's why I started off by asking John about a story he once told in his podcast, a story about finding "the wiggle room." I hope it will help you find some wiggle room of your own. You can listen below, or on iTunes, Blubrry, or Stitcher. Here's a little outline of the conversation, in case you listen when you can't take any notes. First the visual, a sketchnotes version of our conversation, and then the print outline. We started by diving into the concept of WIGGLE ROOM. 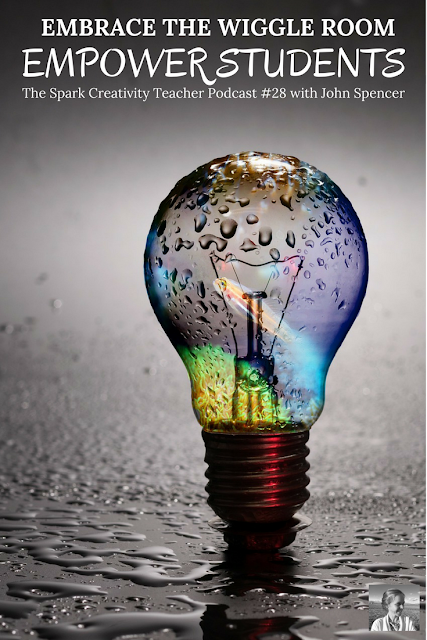 So many teachers feel frustrated, locked into teaching systems that seem to have no room for creativity. "There's almost always more freedom than we think," said John, then shared several examples from his own teaching. In one course, he had a rigid mandatory language block with his ELLs, but he was able to teach all the skills required by having his students do inquiry-based podcasts they called "Curiosity Casts." 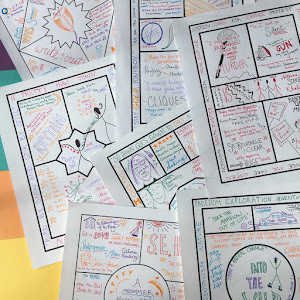 In another, he transformed a mandatory grammar hour replete with workbooks to a Genius Hour project in which the students learned the skills by writing their own "Geek Out Blogs." From there we began talking about his book Empower, and about an amazing metaphor he used to describe the various methods of teaching. Baskin Robbins Teaching: The 31 Flavors. Teachers do the work, providing students with varied and engaging lessons. Coldstone Creamery Teaching: Personalized Learning. Students have lots of choice but it is all highly programmed, they do not control the process. Froyo Teaching: Students have lots of control over both process and content. As we dove deep into Froyo, John reiterated that "empowering students is NOT extra work." It's unpredictable, full of adventure, exciting. Next I asked how teachers might begin to dive into this realm of empowered learning. John suggested starting simply. After all, "it's a process!" He suggested choosing one area of your curriculum and one project. For example, take a wasted day, in which the nature of your school calendar is going to dictate that not much is accomplished. Try out a wonder day. 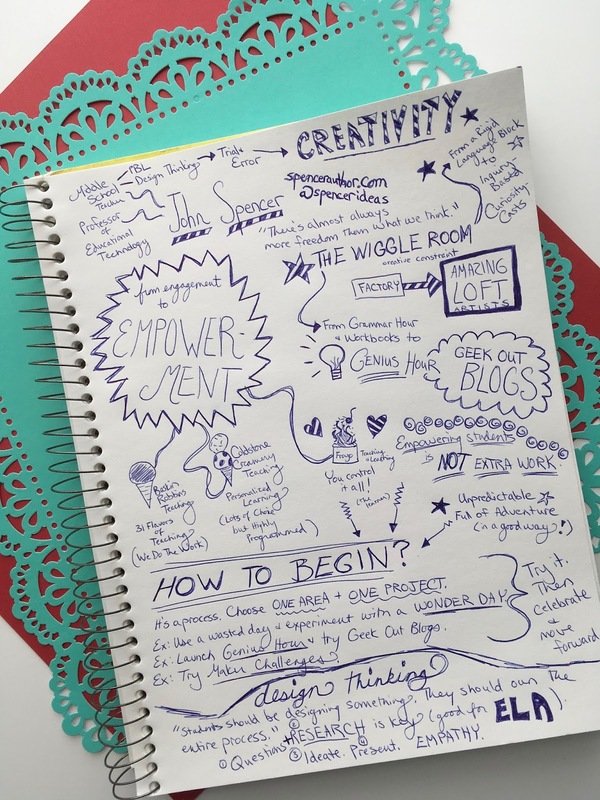 Or launch a genius hour project and try "geek-out blogs." Maybe give maker challenges a try. There's no need to rewrite everything you're doing. Just experiment. Try one thing and see how students like it. See how you like it. See if you are indeed able to cover the standards you need to cover while also empowering students to pursue their own passions a bit more. We also talked about design thinking, and how it is actually a very natural fit for the ELA classroom. "Students should be designing something," he said. "They should own the entire process." And the secret sauce is empathy. Students must be thinking deeply about the audience for whom they are creating. Finally, we talked for a moment about the charge to teachers John once made on his podcast, to change the narrative of our schools to be more positive. Everywhere I look in schools I see amazing teachers doing amazing things, yet the phrase I so often hear is "our struggling schools." Ick. While there may indeed be bureaucratic struggles, testing struggles, financial struggles, and political struggles, there are also incredible things happening, and our news media isn't telling that story. So let's tell it ourselves. Start telling the world about the amazing things happening in your classroom in your social media. 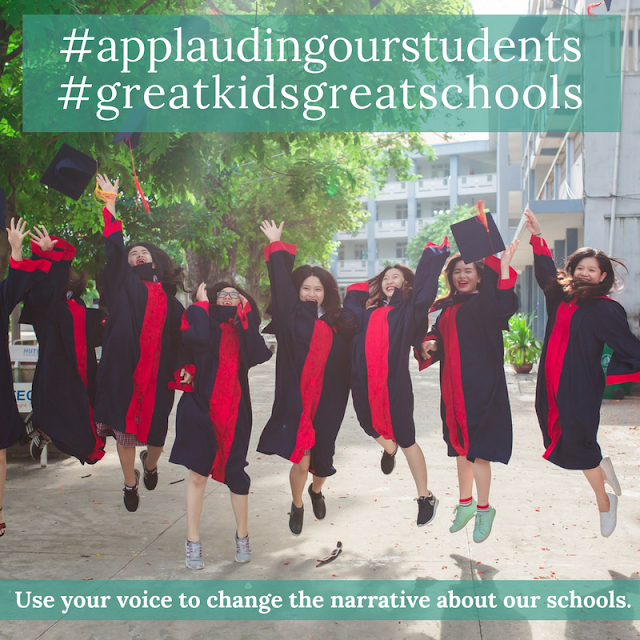 And use the hashtags #applaudingourstudents or #greatkidsgreatschools so we can all come and celebrate with you. Because we ARE the change we want to see in the world, and it's time to tell everyone. Ready to learn more about John Spencer and his work? You can find his amazing blog right here, and then I suggest sprinting (virtually) straight over to his youtube channel over here. After six or seven productive hours watching all his videos, you'll be ready to subscribe to his podcast on iTunes here. Or you can always find him on Twitter or Facebook.